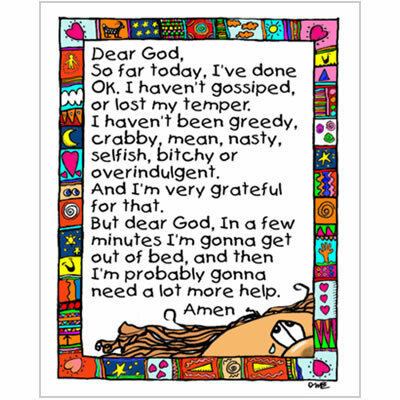 "Dear God, so far today I've done okay. I haven't gossiped, or lost my temper. I haven't been greedy, crabby, mean, nasty, selfish, bitchy or overindulgent. And I'm very grateful for that. But dear God, in a few minutes I'm gonna get out of bed, and then I'm probably gonna need a lot more help. Amen."